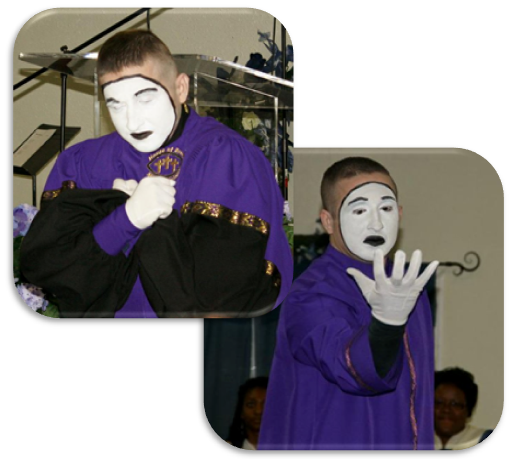 House of Bread Mime Ministry was organized in April of 2009 by Bro. Timothy La Vergne, II. This ministry is a part of Bethlehem Baptist Church under the leadership of Rev. Stuart P. Courtney, Senior Pastor. The House of Bread Mime Ministry & Junior Mimes is Directed by Bro. Timothy La Vergne, II and supported by many Youth Advisors. The vision of House of Bread Mime Ministry (HOBMM) is to demonstrate God's love locally, regionally, nationally and globally. Our mission is to minister to the nations, proclaiming the gospel of Jesus Christ on every occasion, as we bring the art of mime to a greater level of acceptance and appreciation. HOBMM will achieve this mission by integrating mime with skits, drama, dance and real-life testimonies into a combined form of worship and praise unto Jesus Christ. Mime is a powerful expression of worship through dance and interpretation. Here at Bethlehem, we have been blessed to have a young team of, well, mimes, to bless not only those in church, but those in the surrounding neighborhoods as well through their numerous, well-choreographed performances at services and special events. Check on YouTube.com under "Bethlehem Baptist Church Bonham" for more House of Bread & Youth Mime Ministry videos.